MasterRents has scissor lifts as part of out rental fleet. Why a scissor lift rental in Massachusetts? You may be wondering what is a scissor lift and what can I use it for. 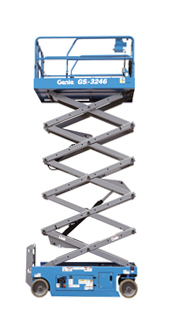 A scissor lift is an aerial work platform used to provide access for hard to reach high areas. Scissor lifts maintain a presence in nearly all aspects of manufacturing and production, from construction to assembly and beyond. There are many manufactures of scissor lifts, but the three top brands are Genie, Skyjack and JLG all of which MasterRents can provide. There are also two classes of scissor lifts, the slab scissor lift and the rough terrain scissor lift. The slab scissor lifts increase worksite productivity by providing large workspace platforms. These types of scissor lifts are great for maneuvering in and out of tight spaces, and are great for both indoor and outdoor construction. The rough terrain scissor lifts are more construction orientated, providing 4-wheel drive and traction control. They increase productivity in demanding outdoor jobsites; they also provide a large platform and fast lift speeds to get the job done faster. MasterRents is here to help you with any questions you may have about scissor lifts or any of our other pieces of rental equipment. We have a full time salesman as well as a knowledgeable staff. MasterRents offers short term rentals at reasonable prices; please contact us at 978-762-RENT (7368) for more information. We look forward to serving all of your rental needs.